Employee training forms a crucial part in the HealthCare Industry. As this industry directly deals with the well-being of their customers, it is necessary that each stage of the business comes under strict norms and guidelines to ensure the quality of its product and services. As a Healthcare organization, you need to train your employees with the highest standards in order to establish your stronghold in the market. Learning can happen through various mediums. Plain text, images, audio books and many others can be used to impart knowledge to your employees. But, for all these forms of learning to deliver quality knowledge transfer, learners need to pay a high level of attention towards the content. On top of that, healthcare employees seldom have that kind of time to spare owing to the critical nature of their work. This usually gets associated with increased amount of stress in the learner as the mind has to work double in order to absorb the knowledge. Above that, in today’s hectic work life, giving your 100% attention while reading a training text or listening to an audiobook may not always be possible. But, this doesn’t hold true for video-based learning. For any healthcare organization, compliance laws are very stringent. Failing to adhere to them can have serious consequences on their success. However, imparting compliance training to your employees is easier said than done. As compliance training consists of plenty of rules and regulations, learners are quickly put off when you try to convey this using traditional methods. Using videos, you can liven this rule-heavy learning topic. Create animated videos explaining the reasons behind adapting the compliance policies or use live videos to breakdown complicated compliance rules and you can create an innovative strategy using videos. Compliance when conveyed through videos will result in better retention and recollection. A healthcare organization that manufactures pharmaceuticals or other health related devices, will have to deal with highly reactive chemicals and raw materials. They will also need to use potentially hazardous machinery. For your production line to run smoothly, it is imperative that your employees are aware about all the different aspects of safety. 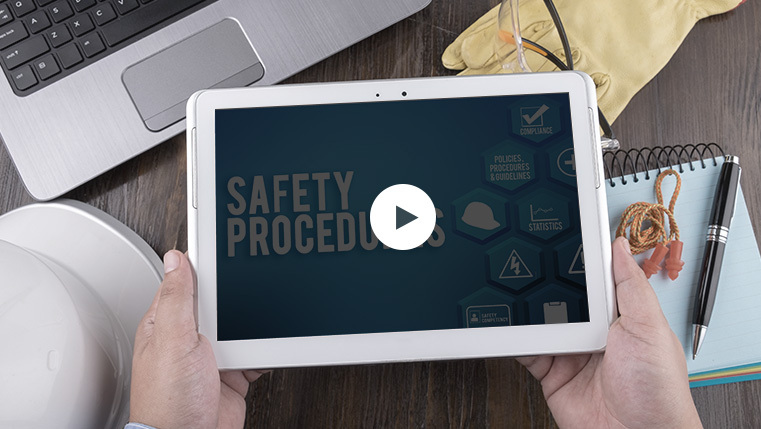 Using videos, you can create a comprehensive session that conveys all the different safety precautions that are necessary. You can even create animations around the consequences of a mishap to give learners the right motivation to undertake the training. You can also create short, just in time learning videos, that learners can access just before performing a task, for maximum recollection. Your healthcare product is only as good as the sales team selling it. But training your sales team using traditional methods is yet another challenge. Always on the run, ever pressed by targets and client demands, sales employees seldom find the time to sit and take a long e-learning course. The power of videos can come in quite handy for sales training. As videos can convey a huge amount of information in less time, it is perfect for employees who are always parched for time. Since watching videos is a stress free activity, your sales force can watch them in whatever little free time they have. Creating products for your healthcare needs is a complicated process. Organizations use sophisticated machinery and refined production processes in order to create a product of the highest quality. Videos can prove to be of great assistance in imparting work floor training. Keep in mind that employees on your work floor come with widely different set of qualification and experience. Using videos for training them can help you achieve equilibrium as videos are grasped quickly by almost everyone. Topics like best manufacturing practices, machine maintenance procedures, medicine storage methods and many more such topics can be effectively conveyed through videos. Learners can repeatedly watch such videos until they have perfected the task at hand. Videos can prove to be a boon when it comes to imparting useful healthcare training. Keep in mind to take the assistance of a leading e-learning vendor to utilize videos in the right way for the maximum impact.